It's Muffin Tin Monday, and this was a very tasty dinner we had one evening. I enjoyed breaking out the totem poles cups again. Baked salmon and roasted onions in a creamy dill sauce, wild long grain rice, and roasted brussels and carrots, plus a side skewer of grapes. Turns out Mom and Dad enjoyed the salmon more than the kids did. Oh well, more for us! 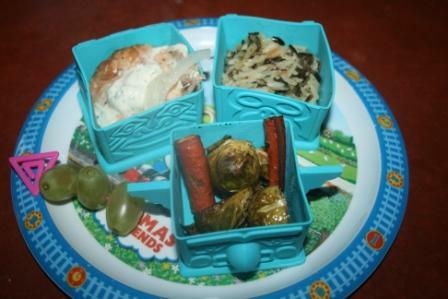 Find more fun lunch ideas at Muffin Tin Mom. Totem cups? That is awesome. You find the coolest things! I will take his salmon. Wait we are going to have salmon tonight for dinner! You have so many muffin tins... Where in the world do you store them all. I have a lot of cabinets in my kitchen and they are all full. Love the totems!! I am so glad that Brussels are back in season. Sounds like a really good dinner! Those totem cups are adorable! I'd have to pass on the salmon too, but it still all looks cute! YUM!!! WE love salmon too and it is one of our biggest hopes that our kids will one day enjoy seafood as much as we do. i know I've said it before but I love those muffin tins! Looks good... you are making me hungry! Very creative Lisa. Yeah, for our kids refined tastes means adding ketchup to the hot dog. OMG does that look awesome! You sound like a great chef! Yum, Lisa. Looks like a great meal... Do the kids eat better when you have Muffin Tin Monday --or some special way of making food more appealing to them???? yum!!! I love Brussels sprouts, but learned that as an adult! That looks and sounds delicious. We love Salmon too. Oh I love salmon! Though I can't get anyone in my family to eat brussel sprouts. Maybe I'm cooking them wrong. those are too cute! Bet they enjoyed it! Well... ok, like you said not the salmon but I bet they liked the rest! Oooh, I haven't had brussels sprouts in far too long. How do you prepare them? Mmm. Cute cups. We usually shred our leftover salmon and have salmon salad sandwiches for lunch the next day.. it's pretty yummy! Love the totem pole cups! Maybe a little ranch dressing for the salmon? My daughter used a little to dress up most things she doesn't like. yummy....your boys are so lucky to have "fun" homemade "happy meals"!! 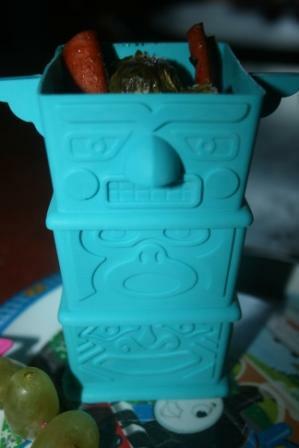 Oh my goodness those totem cups are too awesome and the dinner sounds delish!